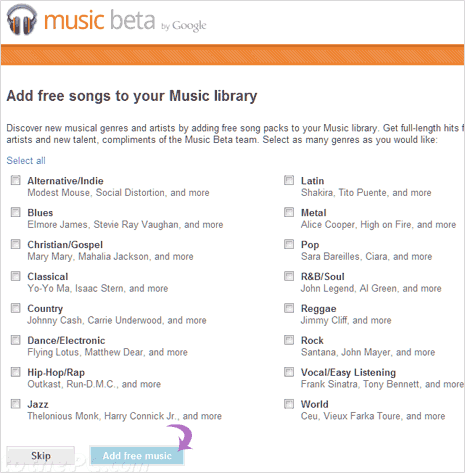 Google’s Music Beta service allows you to upload legally purchased songs and music online for free. Once you upload songs, you can neatly browse them under ‘My Library’ section of your Music Beta account. You can also organize them in the form of music playlists. Further, you can playback and listen songs online in web browser on Google Music Beta website or access songs on Android powered phone and tablets [check music beta system requirements]. When you get invite for Music Beta and continue with registration process, you will get option to add free songs to your account. You will see following screen for adding free music. Select type of songs you want to add like Jazz, Latin, Metal, HipHop and so on. These are full length music tracks from popular artist made available free by Google Music beta service. Songs from selected genre will appear in your Music Beta Library automatically. 1. Login into your Music Beta account (you can request for invite for music beta service). Then click Add music button at top right part. 2. Then click ‘Download Music Manager’ button. Follow onscreen instructions to download and install Music Manager program on your computer. Note: If you want to upload music using Android powered mobile phone or tablet, then click Get Android App link to download Android application for Music Beta service. 3. Once installation is complete, login using same Google account as used to access Music beta service. It will give you option to add songs from Media Player, iTunes or specific folder on your computer. 4. Select location of songs on your computer and this program will automatically start uploading your songs to your Music beta account. There are number of options to configure uploading of songs to your Music Beta account like selecting bandwidth speed for uploading music. You can also switch between manual and automatic mode for uploading songs. Uploaded songs will automatically appear in Music Library on Music Beta service under ‘New and Recent’ tab on left sidebar. Google Music Beta looks like a really nice service. Well, it is a really nice way to store all your music at one place. I haven’t tried it out yet, but would surely love to give it a try.